It has almost been one year since my last post, so it is really time to write something again 🙂 . The transmit power of a radio within an access-point is being represented based on power-levels within the Cisco controller world. I have already written a post about these power-levels and how the configured gain of the antenna is related in the past. But did you know that besides the gain, the regulatory domain and specific channel also the input power of the access-point itself might influence the actual transmit power? With the 3800 serie access-points the radios cannot be enabled when the run on regular PoE, this behavior is different with the 3700 serie. The 3700 access-point will work, but with one receive and one transmit antenna disabled. Besides that also the transmit power changes. Below some calculation examples based on an 3702I-E access-point. So, my advice is to always verify on the cli of the controller with the “show advanced 802.11x txpower” so you can, besides the power-levels, also see the dBm values which the represent. There are quite a few methods to filter certain kinds of traffic on Cisco’s autonomous access-points. This post gives a overview of the different methods and how to use them based on use cases. Note: it is possible to apply this ACL on a sub interface as well (just as with IPv4), however this does not have any effect on the traffic. See also bug CSCva17063. This post is a quick reference for configuring management authentication with RADIUS for AirOS and IOS-XE based WLCs. When new licensing models are being published the first thing that vendors release are the marketing brochures. Due to this is selling the new “stuff” usually not the biggest problem (except when certain features have been moved to another “level”, but how often does that happen.. right?..). The more difficult part is finding out how the new process works and which codes, files and/or commands need to be entered on the box to get it running. This post is about Cisco ONE licensing in conjunction with the 5508 WLC to help fellow engineers 🙂 . Regular licensing for the 5508 WLC is pretty straightforward: you buy a 5508 with a certain amount of AP licenses on it and you can upgrade this amount if needed up to 500 AP licenses. It gets a little more complicated if you add HA SSO in the mix: the primary 5508 needs to have a permanent license (12 AP licenses is enough), the secondary 5508 needs to be at least licensed with 50 AP licenses or needs to be a dedicated HA SKU unit (which is just as expensive as a regular 5508 with 50 AP licenses). With Cisco ONE the idea is that you always buy controllers (C1-AIR-CT5508-K9) with zero AP licenses and depending on your needs you buy a certain amount of C1 licenses. The nice part with those C1 licenses is that also node licenses for Prime Infrastructure, MSE and ISE are included so you don’t need to order them separately anymore. When you order the controllers and C1 licenses you will receive a eDelivery link to download the PAK codes. Those PAK codes can be registered on the Cisco website and will give you for the 5508 controller regular LIC files which you need to upload to the controller. Nice detail: the C1-AIR-CT5508-K9 controller without any licenses can function as a HA SKU as well, which is a much cheaper solution comparing to the regular licensing. Besides doing (traditional) dot1X on the wired switchport on which a access-point is connected, it is also possible to let the wireless controller authorize access-points within the join process. This post gives the necessary configuration for the use of a external AAA RADIUS server (ISE) within this process for AirOS and IOS-XE wireless controllers. Within the Converged Access platform there are a few features which can benefit from the use of multicast traffic flows. In this post I discuss which these features are and how they need to be configured. First of all some generic multicast configuration needs to be in place on which the other features rely. For this post I use two 3650 switches (CAT1 and CAT2) which are directly connected to each other. The wireless management interface is VLAN 601 for both switches. IP multicast routing will be enabled globally and for both switches one switch will be statically configured as as RP for PIM. To distribute the client multicast (and broadcast) traffic as efficient as possible between the switches and the access-points, we can use “multicast-multicast” mode. In this configuration the client traffic will be send to the access-points with multicast as well. Once enabled you can see that a dedicated Capwap interface is being created, which is “Ca1” in this scenario with the SVI of the CAT1 switch as source IPv4 address. On layer 2 level we see that IGMP snooping is active for the two ports on which the access-points are connected. So how does this looks like on the wire? In the red box in the picture below you see the actual multicast packet, the orange box is the encapsulated client (broadcast) traffic. 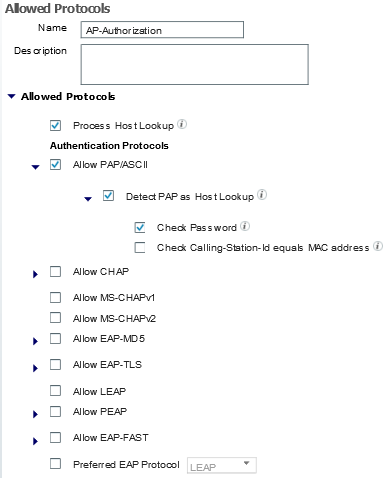 Converged Access works with Mobility Controller (MC) and Mobility Agent (MA) roles in certain Switch Peer Groups (SPG). Those SPG should be designed around areas where extensive roaming is going to happen like one building or floors. Within a SPG you only have one MC but you can have multiple MAs which all need to communicate with each other. Some communication can be done with multicast as well which can be more efficient if you have a few MAs within the SPG. Below the configuration for the MC (CAT1 – 10.60.1.254) and MA (CAT2 – 10.60.1.250). CAT2#*Mar 19 21:33:30.843: *%MM-6-SOCK_SET_ADDRESS_OPTION: 1 wcm: Setting membership for interface IP 10.60.1.250 and multicast group 239.33.33.33 on the mobility sockets. So how does this looks like on the wire? Below you can see the messages being send by the MA when one clients roams between APs connected on CAT1 and CAT2. In this scenario both CAT1 (10.60.1.254) and CAT2 (10.60.1.250) are MCs and belong to different mobility domains. Again the use multicast to communicate with each other. Note: from my own testing I have seen that it is not required to use different multicast address for this. This time a short post about rate limiting on an Cisco AirOS WLC. Under the QoS tab of the SSID configuration you can find two categories of rate-limiting settings; per user and per SSID. For both categories you can specific UDP and TCP rates, however those settings are being applied on the specific radios of the access-point and not on the controller! Below two examples to illustrate what this means. A better location for your traffic engineering is in my opinion somewhere on the next-hop router or firewall, the WLC is really not the device to do this. The (re)marking of traffic is fine, enforcing policies is another story.